On the fun scale, Halloween may rank higher than most other holidays but thrills come at a hefty price. So far, the spookiest holiday of the year is shaping up to be the most expensive yet. Whether you get your quivers from the house of horrors or handing out candy to ghoulish characters that come knocking on your door; count on a spike in your Halloween budget this year. To begin with, the National Retail Federation has been tracking consumer spending for 2016 and their numbers promise to evoke a freak out reaction from the average human being. For instance, based on expenditures for Halloween costumes, decorations, candy and other items, Americans are expected to spend a whopping $8.4 billion on Halloween this year for an average per person cost of $82.93. In the chart below American spent approximately $7.4 billion in 2014 reflecting an increase in spending of $1 billion in two short years. The Cost of Looking Authentic: No matter the cost, it seems we must dress to impress for Halloween. 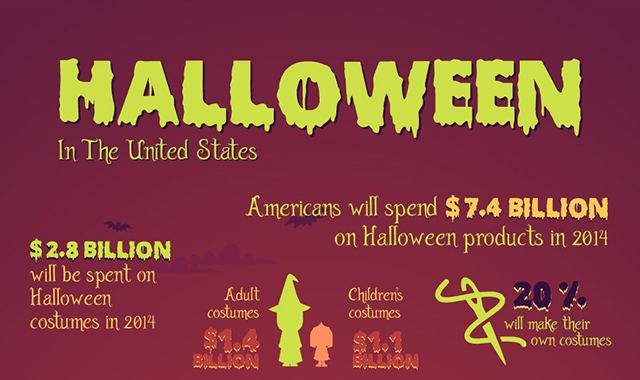 It’s not surprising that at least $3.1 billion and the bulk of Halloween costs is spent on costumes. Every year, playing dress up calls for more authenticity, better quality and higher prices for Halloween getups. The knife in the neck must achieve the purpose of frightening adults as well as children. The walking dead must be replicated exactly in America’s living rooms as it looks on television. For those with visions of stardom or royalty, it would be almost sacrilegious to say no to paying a little more to be draped like Queen of Sheba, Cleopatra, Elvis Presley or Michael Jackson. And just in case you are thinking of a way to honor your favorite presidential candidate for Halloween, you’ll find lots of Trump and Clinton costumes to choose from. The bottom line is, whether you are into guts and gore, fairy tales or intergalactic camouflage, the numbers reveal that people are willing to pay more each year for this night of extravagant pretense. Sweet Hike in Candy Prices: At 2.5 billion estimated by the NRF to be spent on candy this year; trick-or-treating is not what it used to be. But don’t be too hasty to blame Halloween fever for the suspicious surge in candy prices. According to the Bureau of Labor Statistic, candy prices have been increasing at a staggering rate since 1998. A growing demand for chocolate, problems with cocoa production and supply are reasons cited for pricing trends for chocolate sales in the U.S. In a recent report, Hershey which together with Mars produce an estimated two-thirds of the chocolate sales in the country, also attribute the high cost of ingredients as a reason for increasing candy prices. 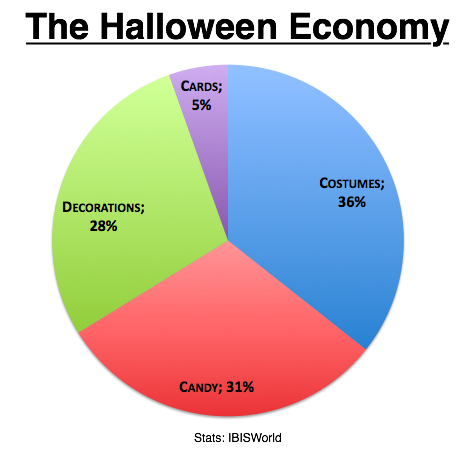 Haunted Houses: As the pie chart above from IBIS World indicate, America’s spending on Halloween decorations is marginally less than on costumes and candy. Evidence of that is easy to see on a drive through just about any neighborhood sans a Halloween Grinch or two. The competition to transform doors, windows, driveways and landscape with the creepiest jack-o-lanterns, terrorizing ghosts, graves and deadly spiders means pulling out all the stops as well as your wallet. Head to thrift stores for recyclable costumes. Most people wear a Halloween costume for only a few hours one day of the year. That means, most are in tip top condition and are a bargain at second hand prices. Also, if you are really good at sewing and enjoy the thrill of creating something from scratch, find inspiration at retail stores then head to your local thrift store to pick up clothing and other items that can be scrapped to create your own unique fear inducing design. Online Resources. Take a few minutes to look at online forums like Craigslist for one of a kind Halloween costumes. If you are a bargain guru, you just may save even more on this year’s festivities overall than you bargained for. Go for Bulk. buy candy in bags that offers an assortment that will satisfy multiple candy lovers. And before you go shopping, estimate how much to purchase based on last year’s left overs. Go Cheap on Decorations: Reuse last year’s decorations or google DIY Halloween decorations for inspiration that you can make for less. Horror Marathon: Head to your local library early and rent some Halloween horror classics. Settle in with your significant other or invite friends over to share their collection and since food and fright is not always the best combination, remember to keep the menu simple. Choose a splurge: If you must look great, make costumes your splurge and keep candy and decoration costs reasonable. Expensive costumes, candy and decorations does not have to steal your Halloween thrills. Whether you are an incurable Halloween enthusiasts or there’s pressure from the kids, make a holiday spending budget and stick to it as best you can. Matt Logan Inc is an independent firm with Securities offered through Summit Brokerage Services, Inc., Member FINRA, SIPC. Advisory services offered through Summit Financial Group Inc., a Registered Investment Advisor. Summit Brokerage Services, Inc., its affiliates and Matt Logan Inc. do not give tax or legal advice. You should consult an experienced professional regarding the tax consequences of a specific transaction. These are the views of Matt Logan Inc, and not necessarily those of Summit Brokerage Services, Inc. and any of its affiliates and should not be construed as investment advice.